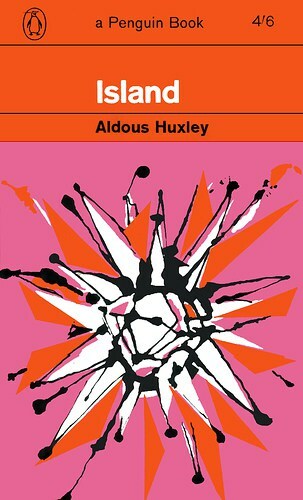 Aldous Huxley’s last novel Island was written in part after he learned that he had cancer and he may have believed that this would be his last opportunity to express his vision of a utopian society in which a key component would be mystical philosophy. Island was published in 1962 and Huxley died almost fifty years ago, on November 22nd, 1963 (the same day, incidentally, on which C. S. Lewis died; however, their deaths were eclipsed in the news by another event, as this was also the day of John F. Kennedy’s assassination). Huxley had spent a lifetime writing about the ways that untapped human potentiality could be nurtured, seeing science as a means to serve humanity for the good rather than science being used to expand the reach of the military-industrial complex he found in the U.S. that sought profit before the needs of people. Any change of the collective human mind would need to be achieved through humanity’s collective re-education or, in effect, by creating the above-mentioned ‘determining conditions’ that would lead to this beneficent evolution. Huxley’s last novel Island was his instructional guide for setting up these determining conditions. Island was the new age before the new age. In 1968, the paperback reprint sold over a million copies. I have been working at my phantasy about a society in which serious efforts are made to realize human potentialities…. The locale of the story is a hypothetical island between Ceylon and Sumatra—independent in spite of colonialism, where the process of turning an old Shivaite-Mayahana-Buddhist society into something combining the best features of the East and West was inaugurated in the eighteen-forties by a Scottish surgeon, (modeled on James Esdaille) who operates on the then Raja under ‘magnetic anesthesia [hypnosis],’ becomes his friend and acts as his collaborator in initiating the necessary changes, which are carried on by successors of the Scotchman and the king, during the succeeding three generations. It is interesting to try and imagine what could be done to create such a place dedicated to eliciting all the latent powers and gifts of individuals, by consciously adopting and combining desirable features from different cultures, Indian, modern Western, Polynesian, Chinese (Letters, 850). The novel’s protagonist, Will Farnaby, is a writer employed by multinational energy corporation to spy on Pala, which may have large oil resources waiting to be exploited. Pala is a small society that is an ongoing experiment in finding means to serve the ends of teaching people methods that achieve the greater good for the inhabitants through re-education of body, mind, and spirit. Will first meets two island children: Mary Sarojini and Tom Krishna MacPhail. They are the grandchildren of Dr. Robert MacPhail who began Pala with the Old Raja. Will is invited to stay at their living quarters. When Will awakens the next morning, he reads several chapters of the Old Raja’s perennially philosophical book, Notes on What’s What. He learns that Pala is a New Age world where many of the ideas Huxley describes have since been developed and written about. In his conversion Will is taken, chapter-by-chapter, into Huxley’s polemical descriptions of a potential paradise. So are readers. The novel’s conflict is between a selfless utopia and selfish capitalist greed. Will is shown around the island. He begins a revelatory reawakening of his consciousness to the potential for human goodness he finds on this benevolent patch of land, which is a much happier place than the profit-driven world he came from. Science integrates with the arts and education to retrain body, mind, and spirit. Huxley details theory and practice based on his lifelong study. There is an Agricultural Experimental Station to breed better crops so that no one should go hungry. The educational and health care systems include the best of the east and west. Organized religion is not dogmatic but is based in mystical intuitive logic and self-experience. God is not an angry God used for propaganda as in the outside world, but a loving God that wishes all of his creation to love and be loved. (Huxley also coined the word ‘neurotheology’ in this novel, for the branch of study which seeks to explain religious experience using neurology.) Huxley’s belief that human nature itself would need to be fundamentally re-oriented through education is paramount in Island. Yet, Huxley knew that the entrenched human nature that already existed would resist a common cause of universal love because the ego is self-serving and self-preserving rather than a vehicle for collective good will. Huxley’s purpose for Island was to embody a safe haven where humanity could work to provide enlightenment on a better way of living. Fifty years later it remains not only current but still prescient and remains a guide to Holistic contentment. David Garrett Izzo is Professor of English. He has a website which includes more information about his research and his work on Aldous Huxley. This is my favourite Huxley book, and I have never understood why it is so often overlooked. Excellent article. Huxley was way ahead of his time in his thinking, I read a series of lectures he did in the early sixties that were collected in a book called “The Human Situation” In one of the lectures he talks about the earth’s resources and how humans should be thinking about ways of managing the ecosystem better and recycling. Nobody listened or took him too seriously which is more than a shame. I agree with Barb as well, Island is his best book and his most positive. About to put this on my reading list. I could do with something thought provoking. I will add this book to my TBR list. Brave New World changed my worldview when I read it as a teenager. Huxley’s best book. Another great book that he wrote is Perennial Philosophy. I highly recommend it. Books like this and movies like “V is for Vendetta” are our best hopes to save the planet for those who come after us.